Delft Spline Systems announces DeskProto V6.0 for five-axis machining. Completely new wizards: including more options, nevertheless easier to use. 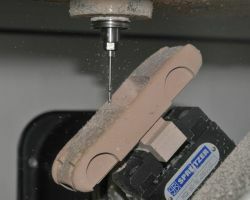 These wizards will automatically generate operations for Roughing and for a smoothing Contour. Also wizards for 2D milling and for Bitmap-to-Relief conversion are present. Five-axis machining: DeskProto now supports five-axis indexed machining, for machines with CNC controlled A and B rotation axes. This makes models possible that could not have been made on a three-axis machine. Multithreaded toolpath calculations: on multi-core PCs so far DeskProto could use only one core, resulting in the CPU Usage not rising above 25% on a quad-core machine, which is annoying for long calculations. Now each operation will be assigned a core, which is much faster. Ramping now is possible for the first movement of each operation. Ramping means that the cutter enters the material along a sloping line instead of by making a vertical drilling movement. The new Welcome screen offers a clear overview of all available options.